Tomorrow’s the day Oceanna goes bi-oceanic. Well technically it won’t really be until Thursday, but tomorrow night we won’t be on any ocean at all. We’ll be on a lake! Gatun Lake. For the Canal transit we are required to have one Captain and four line handlers on board. Our friends Jamie and Keith from Kookaburra long ago singed up to help us out. While we recently commandeered our Chichime surf buds, Jason and Kate, to round us out. We were surprised when ran into them in Shelter Bay Marina as they were scheduled to be in Peru months ago. Unfortunately the yacht they’ve been working on was struck by lightning and they’ve been stuck waiting for repairs. So there ya go, it happens way more than you wish to know. And yes, I did the math, that should leave me free to take all the pictures! 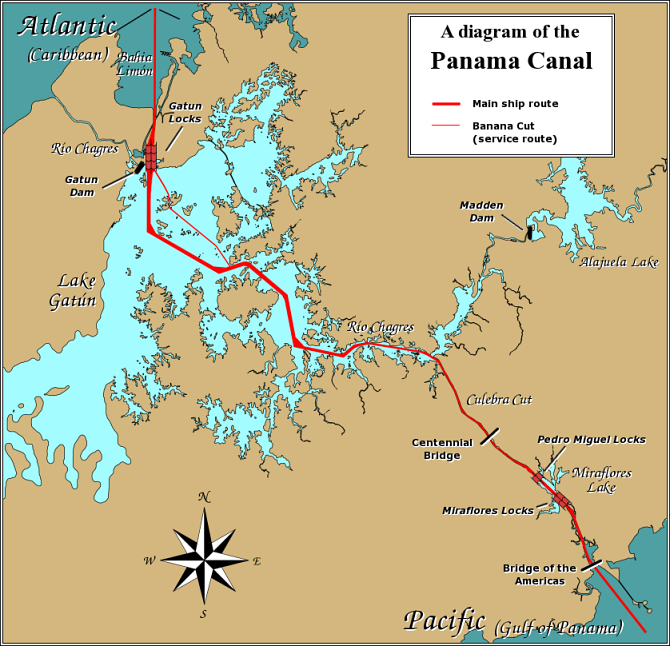 After picking up our advisor in Cristobal Port on Wednesday afternoon, Oceanna and her super crew will head for the first set of locks of the Panama Canal. The Gatun Locks are a set of three locks and should see Oceanna up to the elevation of the interior lake on Wednesday afternoon. After spending the night on the lake with the crocodilos we’ll transit the Gaillard Cut to get to the last three locks to the Pacific. The Pedro Miguel Locks and the Miraflores Locks will lower us back down and we’ll head for the Bridge of Americas to announce our arrival onto the Pacific Ocean. For anyone wanting to set their eyes on Oceanna, the Panama Canal has real-time webcams set up at each set of locks. Click on this webcam link or go to the website listed below and pick the tab associated with the locks we’re in. As for timing, we’re scheduled to pick up our advisor at 3:15 pm (Panama Time) on Wednesday afternoon. From there we should be heading to Gatun Locks. On Thursday I’m not too sure how timing works out. I will do my best to update our whereabouts on the Twitter Feed at the right hand side of the blog. Under “Oceanna Real-Time Updates” I’ll post when we’re arriving at each set of locks. Hopefully it works out and Oceanna’s transit is a real success. So excited when we saw Oceanna in the first lock!! You seemed to be behind a very large ship but we could easily make you out!!! Thanks for all the info keeping us informed!!! It got dark too quickly but are hoping for some good viewing tomorrow morning!!!! I’m so glad the second day was better for seeing us on the webcams. It was real cool to know you guys where at home watching! I can see everyone on the front of the boat and on the trampoline…wish I was with you! Did you wave? I think I saw you waving. We were definitely waving!! So happy you got to watch Mom. I hope supper wasn’t too late to the field because of Oceanna! Congratulations!!!! You made it through–we watched nearly all day –so exciting watching you guys–we’ve got lots and lots of photos!!! Relax now!!!!! Couldn’t of had a better angle to view you guys!! I am Jaime’s sister and by the time I got home and on line, you must have already made it thru, so congrats!!! Thanks Jenifer! We’ve got tons of photos, including Jaime and Keith in action handling the lines, so I’m sure they can share those with you. Thanks for following along Judy and Ken! It made it even more special knowing or friends and family were “there” with us. Hi, Amanda, Darlene and I took a coffee break and watched you. Fantastic! Thanks to Shea for letting us know! Oh yay! I’m very happy to know you ladies were following along! Did someone make popcorn? !